As someone else who lives in south west PA, I feel your pain. But if it helps, the new Studio Series line is re-releasing Cogman with a new paint job here next year! As someone who quite likes legion class figures, this (and even more so the line before) was real disappointing. The molds were mostly from TF Prime and thus looked nothing like the actual movie characters (like Stinger being a KnockOut repaint, Berserker being a Breakdown repaint, Barricade being a very bland Prowl repaint, Grimlock being rippersnapper, etc etc). I did hear the Megatron one from TLK was, I heard, a new mold along with some others. Nacelle wrote: As someone who quite likes legion class figures, this (and even more so the line before) was real disappointing. The molds were mostly from TF Prime and thus looked nothing like the actual movie characters (like Stinger being a KnockOut repaint, Berserker being a Breakdown repaint, Barricade being a very bland Prowl repaint, Grimlock being rippersnapper, etc etc). I did hear the Megatron one from TLK was, I heard, a new mold along with some others. They can also be found at Ross if you look hard enough. So, do you guys remember that Universal Studios Deluxe Snarl Exclusive? Well, it appears as though this figure is the latest in the lineup of The Last Knight based figures to end up at the $7.99 pricepoint at Ross! 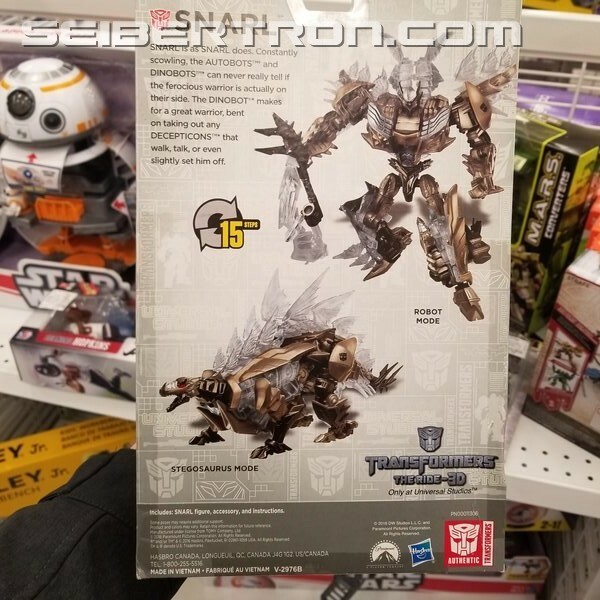 Thanks to Seibertronian Reluctantyouth, we have word that Snarl has hit Ross, showing up in Illinois for the very reasonable price of $7.99, which is pretty cheap considering his BBTS self is $19.99 and he is around $35 to $40 at Universal itself. This figure joins the Wave 3 and 4 The Last Knight toys to have hit stores like Ross, following in the footsteps of Bumblebee, Strafe, Crosshairs, Cogman, and others. 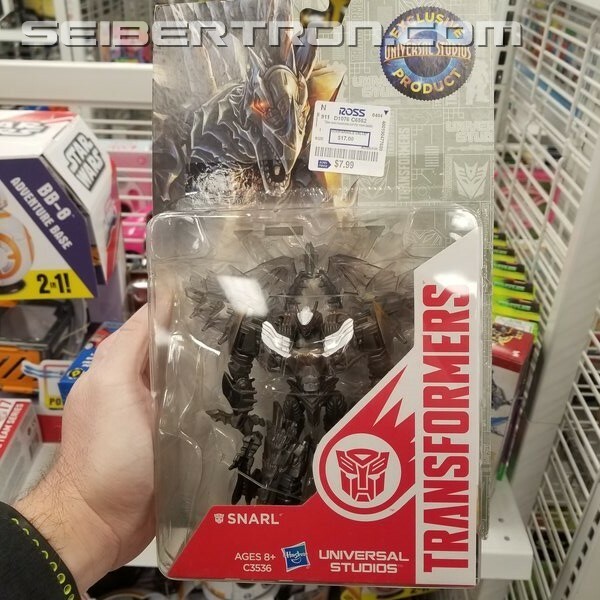 For those who might not remember, Snarl is a repaint of his Age of Extinction toy, now done in the similar sort of smokey gray that can be found in the other The Last Knight dinobots, attempting to be more screen accurate like Studio Series Grimlock (despite not showing up in the movie proper). Check out the photos below, and let us know if you plan to hunt down this figure in the comments section below! And if you do find, him, why not share it in our Toy Haul Thread! For me, that's a good find. Unfortunately no Ross's near me. I already have the green Snarl, but... No, don't think even of double dipping, you still have the AoE lineup to finish! JelZe GoldRabbit wrote: I already have the green Snarl, but... No, don't think even of double dipping, you still have the AoE lineup to finish! What figures from AoE do you still need? I too have the green one, but for the others I got the Takara Black Knight redecos since (at the time) they were most movie-accurate versions. Except for Grimlock. I missed out on his AOE Leader mold and instead got the Studio Series Leader when it came out later. But since Snarl's all green while the others are black and gray, I just treat Snarl as a sort of permanent "Super Saiyan" kind of powered up dude. Oh, and I did also get the normal blue version of Slash, but regretted that one enough to not care for the gray one released later. Blue Slash just stays in dino mode since its the less bad of the two modes and, well, Slash's odd colors are just written off as Slash simply being an odd one among the Dinobots. I did get the Evolution 2-pack Voyager Grimlock too (which means I also got the sad Energon Grimlock redeco), but only because its deco looked the nicest at the time and there was no foreknowledge of the TLK Voyager redeco yet to come. Thanks so much for the highlight on main page. I have two ROSS within 10 minutes of me. Each ROSS had just (1) Snarl. If anyone lives in the Peoria, Illinois area...I left the one at ROSS out by Five Guys. 4,232 pages were recently viewed by 502 unique visitors. This page was viewed 1 times on Monday, April 22nd 2019 4:05am CDT. © 2019 Seibertron, Inc. DBA Seibertron.com. All Rights Reserved. Established June 2000. Seibertron.com is owned by Ryan Yzquierdo.